Bonjour! I know, the Tour has started and I’m late… but there is a good reason! 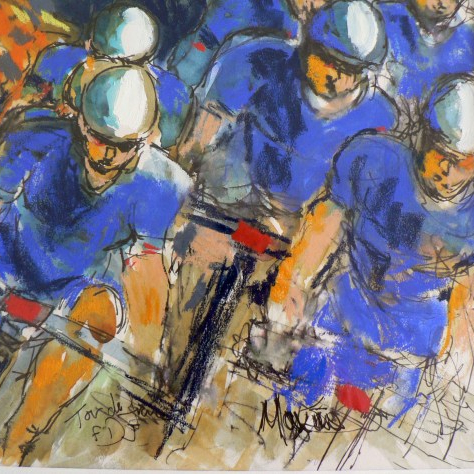 My good friend Sue, owner and curator of jGallery in Moulton, Northampton, contacted me with an idea of a new show celebrating not only the Tour de France but cycling itself – from vintage to ultra-modern. The key word for us was ‘funky’! This show should be a little bit different… so do go along to see! The exhibition runs from 18th July to 4th August. The show will feature 26 of my original pictures from the Tour de France races from 2012 – 2017. There are framed watercolours, pen and ink, along with mixed media images in acrylic and pastel. I wish I was in the UK to come and visit, it sounds like an excellent venue to promote your talent! (Though I don’t have to go far to see 2 of your best works! 😊) Good luck with the exhibition. Brilliant! I’m sure it’ll be a huge success.